This article was published by ComputorEdge , issue #2649, 2008-12-05 , as the cover article, in both their PDF edition (on pages 8-11) and their website. If you are in the market for a personal computer, there are many options open to you: You could choose a desktop or a laptop. You could purchase a new or used machine. In the former case, you could patronize a small computer store in your area, or the computer section of a nearby big-box electronics retailer, or an online computer vendor. As for the operating system, you could opt for Windows, MacOS X, or Linux. You will want to choose the operating system first, as it will dictate which vendors can offer you the best selections of whatever brand you decide upon. There are even more options to choose from when it comes to the PC's actual configuration, i.e., all of the hardware components that comprise the machine: the motherboard, microprocessor, video card, hard drive, optical drives, cables, power supply, and a case to enclose all of them. In addition, peripheral devices need to be selected, such as a keyboard, a mouse, and a monitor. These are the necessities; there are also optional peripherals that can greatly enhance your computing experience, such as a printer, a scanner, a joystick, speakers, and an audio headset. Before I get into the details of what you should consider when mentally putting together your next PC, it should be noted that even though the price of computer hardware has continued to drop substantially over the years, it is still possible to end up paying too much for a computer that has far more capacity than you need. Even worse is to end up with a machine that is inadequate for your needs, and yet still overpay for it. These mistakes typically occur when you are rushed into a buying decision — oftentimes by pushy sales staff at the large retail outfits or during a phone calls to an online computer vendor. Before you go head-to-head with even the most junior salesperson, decide ahead of time what is the most amount of money that you want to pay for your new computer. In making this decision, consider how much value you will most likely derive from your new PC, in comparison to your existing situation. If you currently have no computer at all, and you clearly need one for business or school use, then purchasing one could be extremely beneficial. In contrast, if you currently have a computer that is not performing well as a result of its hard drive and operating system being infested with initially undefeatable spyware, then it would probably be much more cost efficient to invest in top-quality security software to get rid of the spyware, or clean off the hard drive entirely and start with a fresh installation of the operating system and your favorite applications. The foundation of a personal computer is its motherboard and the microprocessor and system memory attached to the board. These three components cannot be chosen at whim, because a particular motherboard only supports a subset of the available microprocessors and a certain type of system memory. As a consequence, computer vendors will oftentimes sell certain combinations of motherboard, microprocessor, and memory, already installed in a computer case, with a power supply. Each one of these "barebone systems" can serve as a foundation, because all of the remaining components can be added, as needed, with few limitations as to their type or manufacturer. For instance, most if not all of the motherboards currently sold support both IDE and SATA hard drives, of all sizes and makes — allowing you to choose whatever best fits your needs and budget. Regardless of whether you select a barebones system or a complete one, you will need to choose a combination of motherboard, chip, and random access memory (RAM) that has the performance capabilities to support the computing that you need to do now and in the future (or at least as long as you expect to be using this particular machine). As for the microprocessor, most vendors carry systems using a chip made by Intel or AMD. The latter chips tend to provide more bang for the buck, and are a favorite choice among low-end PCs. Do not allow an over-eager salesperson to talk you into spending more for the Intel brand name. Both brands are reliable, and your choice should be dictated more by whichever motherboard appears to be the best for your needs. Once you have selected a motherboard and a chip brand, you then must choose the microprocessor model and speed. The faster the chip, the faster it will perform operations requested by Windows or whatever operating system you are running. But the faster the chip, the more expensive it will be. A knowledgeable salesperson can show you the "sweet spot" on the chart of speeds and prices, where you get the most incremental speed increase for the least incremental price increase. As for the system memory (RAM), consider what sort of demands you will put upon your future PC. If you already have a computer, how many applications do you usually have running simultaneously? The more you have, the more RAM you will want. One gigabyte (GB) is, as of this writing, the standard amount offered in low-end PCs. It is sufficient for most people, who generally only run a handful of applications at once — a word processor, a spreadsheet program, a Web browser, and a security suite. Even 520 MB would be fine for most people, assuming they stay away from Windows Vista. To check your current memory needs, start up the maximum number of applications you use simultaneously; open Windows Task Manager (Ctrl + Alt + Del); click the Performance tab; and check the bar labeled "CPU Usage". If it is above the 80 percent mark, then opt for more memory in your next system. Keep in mind that additional memory can generally be added to a motherboard at any time, provided that the current amount of memory is less than the maximum supported by that particular motherboard. Even though desktop applications are gradually being supplanted by their Web-based counterparts, and more people are storing their personal data online, hard drives are still essential in just about any computer. In selecting the data storage for your new PC, consider how much hard drive space you currently are using, and how much you anticipate using in the future. A common rule of thumb is to first determine your current usage, double that, and then multiply by the number of partitions you want to use. Assuming that you are running a Windows machine, to determine how much space you are currently consuming, open up Windows Explorer, and for each hard drive listed (starting with C:), click on the drive letter in the left-hand Folders panel, and then press Alt + Enter. Figure 1. 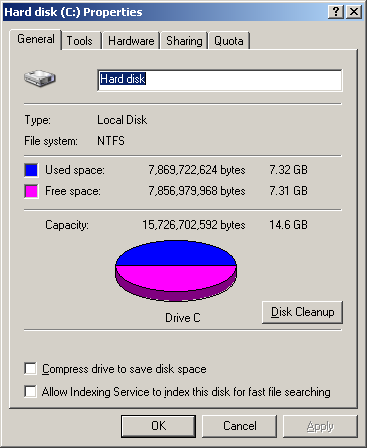 Hard drive space usage. As of this writing, in the typical low-end Windows PC, one will find a 250 GB hard drive, which should be more than enough room for most people's needs, unless they try to save a large number of movies on their hard drives. (Writable DVD discs are much better suited for that task.) Hard drives up to one terabyte are also available. But bear in mind that it is better to have two medium-sized drives than one huge one, because then the second drive can be used as a full backup of the primary drive. Never assume that your hard drive is immortal, and always have backups. In the realm of optical drives, the choices are fewer and more straightforward. CD-RW drives — which can read and write to CDs — are standard. Combination CD-RW/DVD-R drives are becoming much more common, as the industry shifts from CDs to DVDs, and their much greater capacity. DVD-RW add the capability of burning your own DVD discs, and would be of most value to anyone interested in copying movies. There are additional PC components for which your favorite hardware vendor may offer alternatives. You most likely will have a choice of video cards. For the majority of computer users, the low-cost card included with the vendor's standard package, will probably be sufficient. But if you plan on playing graphics-intensive video games on your computer, or you do Web design or other graphical work that would benefit from a higher-end card, then the additional expense would be worth it, over the long haul. The power supply unit (PSU) that is included in a starter machine, will probably provide enough juice for most users' needs. But if you plan on adding more components to your computer, or having the shop do it for you, be sure to calculate how much total power will be needed by all those devices, and choose a power supply that provides more than enough, with room to spare. Also consider the number of fans in your PC, because each additional fan increases the power drain, just as it increases the noise of the machine. On the other hand, it should reduce the internal temperature, which in turn extends the life of all of the components inside the box. Speaking of cases, you even have some options in that department. A standard steel case does a very poor job of dissipating heat, and can thus only do so through the fan vents. If you want a PC that dissipates heat well from all sides and from the top, and is lighter to carry, then paying extra for an aluminum case would be a sound investment. Another way to increase heat dissipation is by increasing airflow through the use of rounded IDE cables, instead of the flat ribbons. Rounded cables also make it easier for you or a computer technician to work inside of your machine. Unless for some reason you like the high-pitched whine of hard drives and fans, consider opting for an extra quiet power supply and fans, to reduce the overall noise generated by your computer. They cost extra, but will pay off dividends — particularly if you want to use the machine in your living room, perhaps as a media server. Just as the diskette is going the way of the dodo bird, so too is the modem, with most people now connecting to the Internet with broadband access (cable or DSL), both of which utilize Ethernet. On the other hand, you may have a profession — such as day trading stocks — that makes Internet access an absolute necessity, or you may suffer from frequent Internet outages due to a flaky ISP. In such cases, a modem could be worthwhile, as backup — especially considering how cheap modem cards are nowadays. They can also be used for sending faxes from word processors and other applications. There's more to a PC than just the "guts of the box". Just about everyone will need a printer, and can choose between laser and inkjet, with various price tags and levels of quality. Scanners can be extremely useful for making digital copies of all kinds of documents, the sides of product containers, and much more. Fax machines may be worthwhile for small-business owners, though there appears to be declining demand for faxing, as people shift to electronic documents (including editable PDF files). If space is in short supply, consider a combo printer/fax/scanner. For any of these types of peripherals, it is definitely best to buy locally, so you would not have to ship a heavy and bulky malfunctioning unit back to the vendor. If you enjoy listening to music or webcasts on your computer, or you would like to watch movies using your DVD player, then consider upgrading from the cheap speakers that might be included in a bundled package. Speakers that draw their own power tend to be higher-quality and can be turned up with less distortion. Last but not least, one of your best investments could be in an ergonomic keyboard and pointing device, instead of the standard "five dollar" keyboard and mouse that accompany most systems. Such flimsy keyboards and mice may seem cheap compared to ergonomic alternatives, but if you end up suffering from repetitive stress injury (RSI) as a result, they will be a lot more expensive in the long run. My personal favorites are keyboards by Kinesis and touch pads by Cirque. Regardless of which options you choose for your PC's configuration, the time you spend researching the many alternatives — through hardware websites, forums, and tech-savvy friends — will pay off in the form of a computer that provides all the computational power that you need, without breaking the bank.